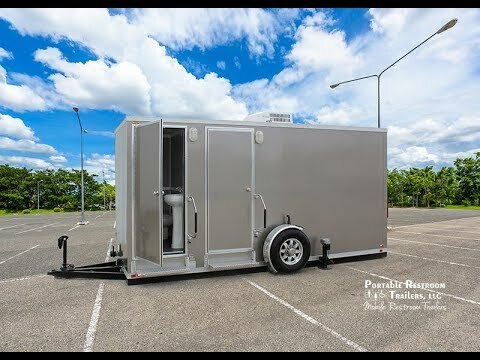 This well equipped ADA Portable Restrooms Trailer + 2 Station | Maui Series offers all the amenities of home in any mobile environment. This unit features (2) compact unisex suites and (1) ADA unisex suite. The ADA suite includes, an ADA compliant toilet, sink, grab bars, and framed mirror. The (2) standard unisex suites include a pedal flush toilet, cabinet sink, and framed mirror. The Maui Interior Package features a 2-tone gray interior and black stone vinyl flooring. This 16' ADA Portable Restrooms Trailer is fully self-contained with a 300-gallon on-board waste tank and a 135-gallon onboard fresh water tank. With air conditioning and heat strips your guests will feel the comfort! The unit also includes LED vacant and occupied indicators, exterior lighting, aluminum wheels, and a utility room with a door. *Photos are use to show Maui interior and may not be actual representation of unit. Please see floor plan and specs for actual layout.